In a large skillet at medium heat start by cooking your bacon. When half cooked add the butter and all the vegetables. When all ingredients are cooked, add your bread and stock in increments. Finish with the fresh herbs. Next layout some cheese cloth so you can wrap the stuffing. Insert the stuffing bundle in your turkey. It is very important that you achieve an internal temperature of 180 F in the stuffing. If you feel the turkey is ready before the stuffing simply pull out the bundle and give it little bit more time in the oven. For the glaze combine all ingredients. 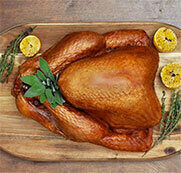 You will want to start glazing your turkey in its last hour of cooking with the syrup glaze. 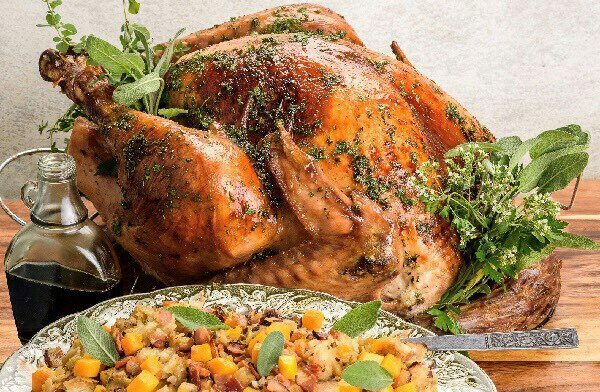 Make sure to glaze the turkey with its natural jus before starting with the syrup glaze. Enjoy!!! !